Former US secretary of state Madeleine Albright supported the murder of hundreds of thousands of Muslims, but now she wants to register as Muslim, American political analyst Myles Hoenig says. 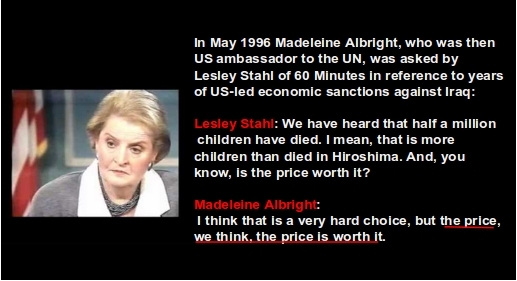 “Albright, who bragged that the murder of half a million Iraqis, mostly children and other civilians, was worth it in order to take out its president Saddam Hussein, now says she’s willing to register as a Muslim if Trump signs an executive order for the creation of a Muslim database. Can hypocrisy know no shame?” Hoenig asked. “Where was she when she was laying the groundwork for the murder of Muslims in the Middle East? Where was she for eight years under Obama when he was supporting Takfiri terrorists in Syria and throughout the area? And where was she when her candidate Hillary Clinton was running for office and calling for her to stop her campaign belligerency towards Muslims?” the analyst continued. Hoenig made the remarks during a phone interview with Press TV on Friday. Albright has said she is “ready to register as Muslim” if President Donald Trump moves ahead with a plan to create a database of Muslim Americans. “I stand ready to register as Muslim in #solidarity,” Albright, the first woman to run the State Department, said in a tweet on Wednesday. Her comments came amid news of a draft executive order by Trump which would announce a ban on arrivals from seven Muslim-majority countries. Albright joined thousands of Americans who have pledged to register as Muslim in response to Trump’s proposal on the campaign trail to set up a Muslim registry in the US. “Others are considering wearing Jewish stars on their overcoats as was done to them by the Nazis. Either approach would be symbolic and a sign of solidarity with not just Muslims, but all minorities, including immigrants, who are, and have been, persecuted by US officials for many, many years,” he added. “There is a Yiddish word to describe what Albright is proposing: chutzpah. Loosely translated, it is the boy who kills his parents and asks for mercy because he’s an orphan. What Albright is suggesting she would do equals that; the murderer of hundreds of thousands of Muslims now wants to identify as such when her choice for president was not elected,” he stated. “If Hillary Clinton were the president, we would likely not see such a registration. But we certainly would see more bloodshed in Muslim countries on her orders. Where would Albright be then? the activist asked in his concluding remarks.